Residential Water UseVolume or rate of water diverted or withdrawn from a water body (eg a stream, lake, or groundwaterWater existing below the ground surface in aquifers aquiferAn underground formation that stores groundwater) for use by humans on the land surface. Actual water use is determined through direct measurement. Water demand is an estimate of actual water use. Across the Okanagan BasinLand area from which water drains towards a common pointThe Okanagan watershedLand area from which water drains towards a common point, or basinLand area from which water drains towards a common point, is a narrow strip that spans from Armstrong, British Columbia, Canada to the US border and includes five main lakes – Okanagan, Kalamalka-Wood, Skaha, Vaseux and Osoyoos – and surrounding mountains. The Okanagan BasinLand area from which water drains towards a common point includes all the land that feeds water to our big lakes, and is almost 200 km in length and 8,000 km2 in area. 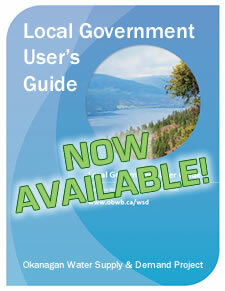 Kelowna, Vernon, Penticton and Osoyoos all lie within the Okanagan BasinLand area from which water drains towards a common point., indoor residential use averages 150 litres per person per day – about the same as the North American average. Outdoor residential landscaping accounts for a year-round average of 525 litres per person per day – for a total consumption of 675 litres per person per day. This means that during the mid-spring to mid-fall irrigation season, total residential water useVolume or rate of water diverted or withdrawn from a water body (eg a stream, lake, or groundwaterWater existing below the ground surface in aquifers aquiferAn underground formation that stores groundwater) for use by humans on the land surface. Actual water use is determined through direct measurement. Water demand is an estimate of actual water use. 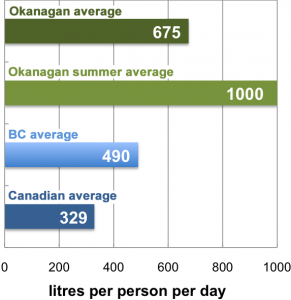 by Okanagan residents averages more than 1,000 litres per person per day. These rates of water useVolume or rate of water diverted or withdrawn from a water body (eg a stream, lake, or groundwaterWater existing below the ground surface in aquifers aquiferAn underground formation that stores groundwater) for use by humans on the land surface. Actual water use is determined through direct measurement. Water demand is an estimate of actual water use. significantly exceed the B.C. 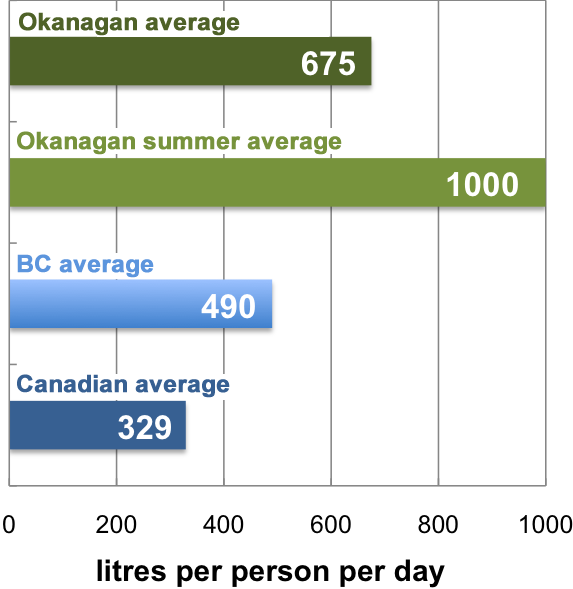 (490 litres/day) and the Canadian (329 litres/day) averages. 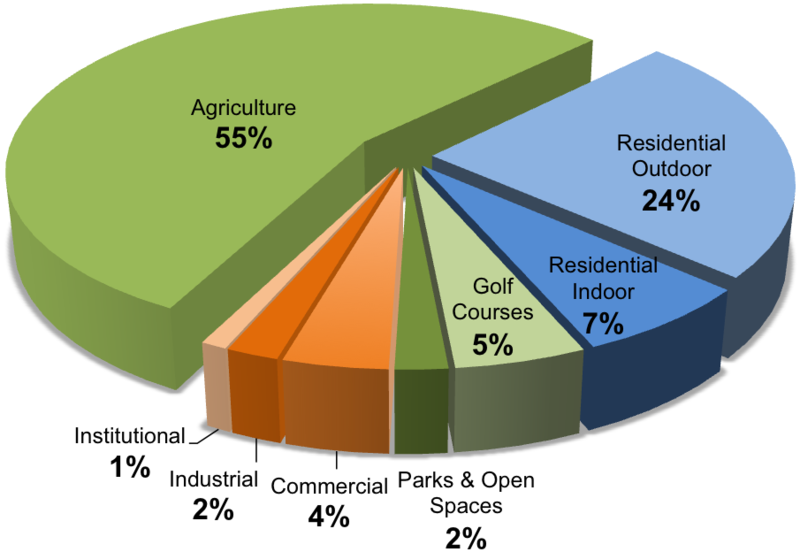 86% of the water used by humans is for outdoor purposes: 55% is used by agriculture, 24% for residential outdoor use, 5% for golf courses , and 2% for parks and open spaces. Only 14% is used indoors: 7% in homes, and 7% for commercial, industrial and institutional buildings. In total, an average of 219,000 million litres (MLMegalitre. One ML = 1,000,000 litres, i.e. 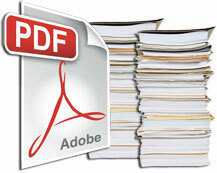 1 dam3) is used for human needs each year. The actual amount each year varies depending on climate conditions. Efficiency of Outdoor Water UseVolume or rate of water diverted or withdrawn from a water body (eg a stream, lake, or groundwaterWater existing below the ground surface in aquifers aquiferAn underground formation that stores groundwater) for use by humans on the land surface. Actual water use is determined through direct measurement. Water demand is an estimate of actual water use. The agricultural industry is a relatively efficient user of water compared with other outdoor users. Agriculture uses 120,000 million litres (MLMegalitre. One ML = 1,000,000 litres, i.e. 1 dam3) of water per year to irrigate 18,300 hectares (ha), an average of 660 mm per ha. 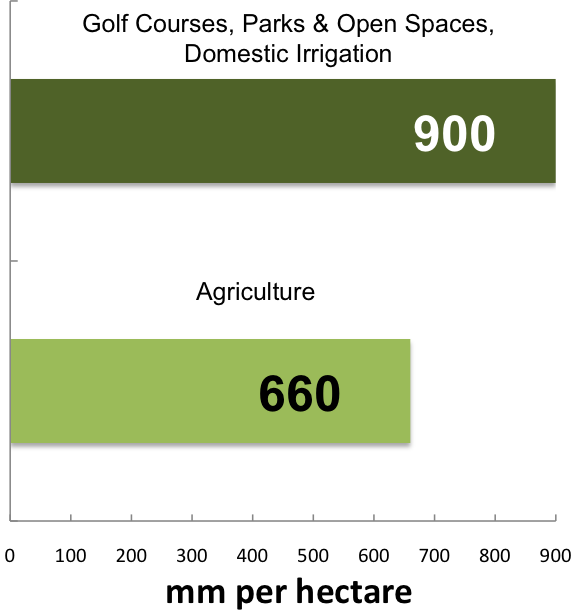 The other three main outdoor uses – golf courses, parks, and residential landscaping – use a total of 68,000 MLMegalitre. One ML = 1,000,000 litres, i.e. 1 dam3 to irrigate 7585 ha, an average of 900 mm per ha. Measurement and record keeping of bulk water withdrawals by major water suppliers and large individual licensees has not been standardized and is patchy and inconsistent, which creates problems for coordinated water management. 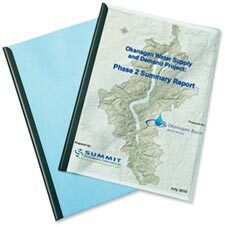 The BC Water UseVolume or rate of water diverted or withdrawn from a water body (eg a stream, lake, or groundwaterWater existing below the ground surface in aquifers aquiferAn underground formation that stores groundwater) for use by humans on the land surface. Actual water use is determined through direct measurement. Water demand is an estimate of actual water use. Reporting Centre assists water utilities in keeping an ongoing record of how much water we are using – critical information for managing valley water supplies and preparing for the shortages expected with a growing population and climate change. “The BC Water UseVolume or rate of water diverted or withdrawn from a water body (eg a stream, lake, or groundwaterWater existing below the ground surface in aquifers aquiferAn underground formation that stores groundwater) for use by humans on the land surface. Actual water use is determined through direct measurement. Water demand is an estimate of actual water use. Reporting Centre allows utilities to provide current water useVolume or rate of water diverted or withdrawn from a water body (eg a stream, lake, or groundwaterWater existing below the ground surface in aquifers aquiferAn underground formation that stores groundwater) for use by humans on the land surface. Actual water use is determined through direct measurement. Water demand is an estimate of actual water use. data and access historic data for trending. And just as importantly, we are able to see what other water utilities in the valley are extracting, helping us work together and manage our common water resource.” – Bob Hrasko, former Water Supply Association of B.C Vice-Chair and Black Mountain Irrigation District (BMID) Administrator.